My name is Gemma Keyes. Other than my name, I am utterly forgettable - so those who never paid much attention to me in the first place haven't exactly noticed that I've disappeared. Vanished. Oh, it's much more complicated than it sounds. And let me tell you, invisibility comes with its own set of problems. I should tell you about Dr. Samuel Bickel, world-renowned nanophysicist. We used to work together, but I'll be candid with you: he's supposed to be dead. Well, he's not. Instead of the proverbial "six feet under", he's subsisting in an abandoned devolution cavern beneath the old Manzano Weapons Storage Facility on Kirtland Air Force Base here in Albuquerque. "I need to show you what I'm protecting here, Gemma," he insisted. I stared into the clear glass case. I could hear...humming, clicking, buzzing. A faint haze inside the box shifted. Dissolved. Came back together. Reminded me of how mercury, when released on a plate, will flow and form new shapes. Only this...this thing was "flowing and forming" in midair. My mouth opened to a stunned "o" as the silver haze resolved into blue letters. Dr. Bickel hadn't pressed any buttons. Hadn't said anything to them. Hadn't gestured. He grinned. "Ah. They've noticed you." And I need to warn you about General Cushing. The rank and name likely conjure images of a lean but muscled old soldier, face cemented in unyielding lines, iron-gray hair cut high and tight. Let me disabuse you of that impression. General Imogene Cushing is short and a tiny bit plump. She wears her beautiful silvered hair in an elegant braid knotted at the nape of her neck, and she knows how to smile sweetly. With the deadliest of sharks. Love this series, well written, exciting, fun. The reading voice of the voice actress matches the written voice very well. Don't miss this one! I immediately bought the second book and can't wait to read it. The author wrote a truly unique story with interesting characters - good and evil - and kept the entire complex story together without dropping any of the threads. This is very different from the other books I have read by this author, and I wasn't sure I would enjoy it. It's been years since I read science fiction - and I LOVED it!! Audible, where are the next books in the series? This book started rather slow, with all of the background and technical talk. But by the time I was well into it, I was hooked. I came back for the next books in the series and they aren't available! What's up with that. Audible, please, I NEED the next books! What made the experience of listening to Stealthy Steps the most enjoyable? 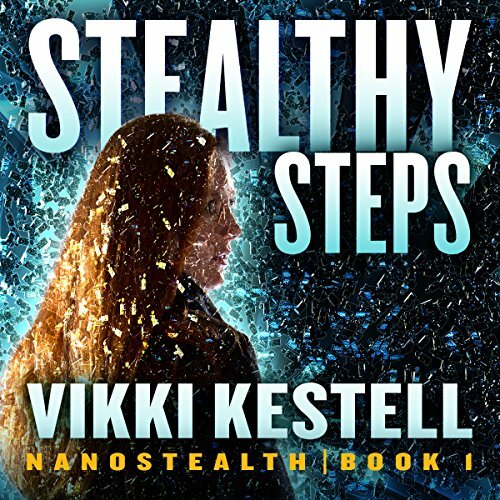 Stealthy Steps was a fun journey into the imaginative world of nanotechnology. What about Reba Buhr’s performance did you like? She has a nice voice for narration but at times I felt her voice was to Young Adult. It was an even read with tension holding consistent in the story line. I loved it! Both the book and the audio version are well done. Between the great character development, lively and clean humor, and intriguing storyline, I couldn't put it down. I'm definitely buying the next book! This book is fascinating! Vikki Kestell has written an original and complex (but not "heavy") plot with creativity in every detail. The main character is vividly human, and her reactions to her changing circumstances are perfect. I look forward to reading (or listening to) the other books in the series.